I’ve blogged about yoga in japan, I’ve done pigeon in Times Square, been featured in Om Yoga Magazine and have taught classes all over Houston. But, never in my wildest dreams did I think my favorite yoga experience would include drool, chubby legs and having my hair pulled. A few months ago I went to my first baby yoga class with my baby. 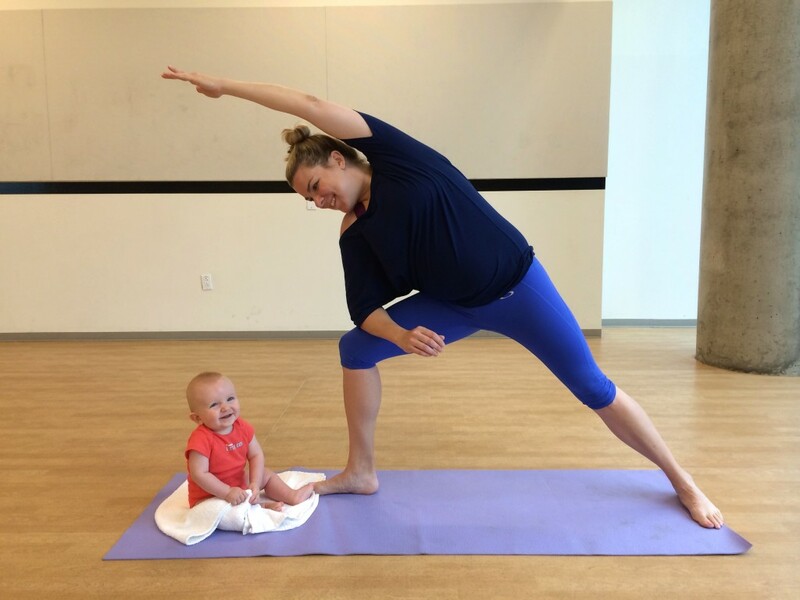 As a new mom and a yoga instructor – it was just what I needed to feel back to normal. I highly recommend doing some sort of yoga once you are cleared by your doctor to workout. 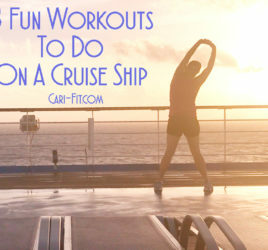 It’s great to build your core strength back up, work on flexibility and relieve stress. The class that I took was great, but it was a little more gentle and focused a little more on the baby (which was fun). Now that my son is older and I’ve been working out regularly – I’ve been able to kick things up a notch. Below are 2 sample workouts that you can do. Start with the first one if your baby is less than 4-6 months old (and will still lie on his back) or if you haven’t been doing yoga regularly. Warmup before you start. Put your baby in a stroller or carrier and walk around the block a few times to get your blood flowing. If the weather is bad – do a simple warmup inside: a few jumping jacks, mini squats or walk up and down the stairs (with baby in his crib or secure area) for 3-5 minutes. Remember to stay hydrated. This is especially important if you are breastfeeding. Don’t over stretch! Remember yoga shouldn’t be painful! Keep your knees bent if your hamstrings are tight and don’t force any poses. Make sure to have a clean mat (bring your own if you are going to take a class) and a blanket the baby can lay on (gym and yoga studio floors are dirty!). Have at least one new toy for your baby to play with in case he gets fussy. Have extra diapers and wipes. Schedule your workout when your baby is not tired or hungry. Keep your stroller nearby (or pack-n-play if at home) in case your baby doesn’t like yoga and that way you can still try to finish your workout. Talk to your baby throughout the workout, give him lots of smiles and tell him what you are doing. He wants to learn yoga too! Start seated (crossed legged or in lotus) with your baby on his back on your mat or towel in front of you. Grab his feet and slowly go around in direction of North, South, East then West taking his legs from side to side while you also stretch in different directions. Change it up and go in circles and then up/down, left/right. Talk to your baby and tell him which direction you are going! Keep your baby on his back for a mini-sun salutation series. Place him in between your hands and come to a plank pose. Take a few breaths here and then make your way to downward dog (be careful – baby may want to pull your hair!). 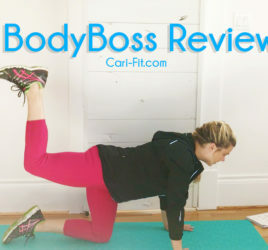 Hold downward dog for 2-3 breaths and then shift your weight back to your hands and come back to plank and smile at baby. Keep going back and forth between plank and downward dog approximately 5-7 times, then rest in child’s pose. In a standing pose, hold your baby at your chest and carefully step back to a lunge position and make your way to Warrior 1. Instead of holding your arms up high (you can do this if baby is on the floor), hold your baby at your waist and rest his body on your front leg (be sure to hold him tightly). As you exhale, bend your leg like you are going Warrior 1 and then as you inhale, slowly straighten your front leg and pick your baby up to chest level (good for your shoulders!). Do a series of 5-7 breaths while bending your front leg (great to build leg strength!). Switch and repeat on the other leg and do the same amount of reps/breaths. To finish – stand in mountain pose (tadasana) and hold your baby in front of you facing out and take a few deep breaths. Feel the strength of your legs and your strong core. This is your time to feel powerful, strong and bonded with your baby! Place your baby at the top of your mat (or on a nearby mat or towel) seated or lying down and give him a toy to play with. Then, near the middle of your mat – start with a basic sun salutation series: mountain pose, roll to forward bend, look up and flatten your back (ardha uttanasana), fold forward again to forward bend, place hands on the mat and step or jump back to plank, exhale to chaturanga, inhale to upward dog and exhale to downward dog, walk or jump your feet to hands, lift up to ardha uttanasana, fold forward to forward bend and then roll or reverse swan dive up to standing. Repeat for 5-10 times. Incorporate Warrior 1, Warrior 2 and Side Angle Poses into your flow similar to this: from downward dog, inhale and raise your right leg in the air and then walk or float it up in between your hands. Rotate your back heel down and inhale arms up to Warrior 1 and hold for a few breaths. Then, exhale and open your body to Warrior 2 (arms out wide) and hold for a few breaths. Finally, move to open side angle. Then, reverse the poses by “spiraling” back up to Warrior 2, then Warrior 1 and then exhale as you place your hands back down on the mat and finish with a sun salutation. Repeat on the left leg. You can do this mini series 1-3 times on each side. Begin standing and face your baby. Slowly make your way to Warrior 3 on the right (balance on right foot) and hold for 3-5 breaths then return to standing. Keep your weight on the right foot and instead of coming back to Warrior 3 and holding – do 3 mini Warrior 3’s by coming forward into the pose and then back to standing tall, while balancing on the right side the whole time (like a single-leg deadlift). After 3 of those – keep balancing on the right foot and come into dancer pose. Hold for 2-3 breaths. Repeat this whole series on the other side and you can mix in a sun salutation in between. Face your baby on your mat in Mountain pose (Tadasana). Inhale and bring arms overhead and lower/squat down to chair pose and hold for 3-5 breaths. Then, clasp hands at heart center and twist over to the right side for “twisted chair”. Step your left foot back into a runners lunge (right leg is bent) and rest your left elbow on the outside of your right leg (right elbow points up, left points down to mat). Then, slowly make your way down to grasshopper pose and hold as long as you want. Repeat on the other side. Finish with pigeon on your mat while facing your baby. To keep his attention you can play with his toy, talk to him or make funny breathing sounds (try ujjaic breath!). After pigeon you can finish with child’s pose or attempt savasana if your baby will allow it!